Here's a bit of beauty to finish off your weekend. The International Space Station zips around the Earth day in and day out, streaking across the sky at about 17,000 miles per hour. 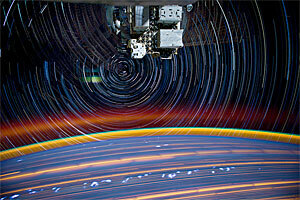 Don Pettit is one of six astronauts currently on the ISS, and in his spare moments he's been making some beautiful photos that capture that streaky flight. Pettit typical takes 30 second exposures of the passing earth, and then stacks multiple exposures into single finished images. Check them out on the Fast Company design blog.